Hello, nature enthusiast! Since you’ve clicked through to this page, I can only assume you’re thinking about buying a Vortex Optics spotting scope. I’ve done extensive research on these products, and can tell you what you can expect for your money. This article will outline the best spotting scopes Vortex manufactures, along with everything else you need to know to make a wise purchasing decision for your first or next spotting scope. My absolute favorite Vortex optic, the 20–60x85mm Razor HD is a serious piece of glass. It’s built around an 85mm objective lens, which offers a tremendous amount of light transmission, but the drawback is the weight such a hefty piece of glass requires. The Razor HD is darned near bulletproof, though, and the optic works perfectly in almost any situation. Yes, it weighs just over four pounds, but the glass is built to be extremely versatile and capable, even so far as being camera-adaptable for catching still images or videos of your favorite nature scenes or wildlife. I struggled here, because any Vortex spotting scope worth buying might not be considered budget-friendly. With that said, the 15–45x65mm Viper HD is a fine choice for someone who wants a quality piece of glass at just a modest investment. The Viper HD provides you with excellent image quality and best-in-class color reproduction, along with an integrated Picatinny accessory rail. However, it suffers from poor eye relief and a narrow field of view. Finally, the dual focus controls are slightly difficult to use if you are wearing gloves. What Do These Spotting Scopes Have In Common? Vortex Optics produces a wide range of spotting scopes, tailoring the products to appeal to as many consumers as possible. Because of this, you might think that every entry in Vortex’s catalog would be different, but there are some commonalities. 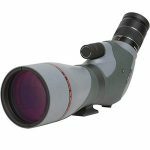 Each model is available with either a straight eyepiece or an angled one, and all of them feature fully multicoated optics for awesome light transmission. Does The Company Include Important Accessories With Its Glass? In most cases, you get at least a view-through case for your spotting scope, along with eyepiece and objective covers. In some instances, you’ll also receive a hard carrying case and a tripod. Personally, the included tripods are never really worth the shipping weight, so I end up tossing them to the back of my garage in favor of professional photography tripods. How Powerful Are Vortex’s Spotting Scopes? 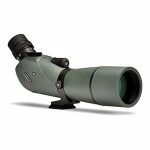 Vortex Optics produces a pretty wide range of spotting scopes, from models that zoom from 11X to 33X and on up to premium optics with magnification levels of 20X to 60X. Most of the glass offers excellent crispness, contrast, and clarity across all the power levels, but there is an exception to that rule: using the Diamondback, it’s almost impossible to get a sharp image at maximum magnification. Are This Manufacturer’s Optics Easy To Use? Spotting scopes aren’t usually a challenge to use, and Vortex makes this easier than most. The vast majority of its products feature focus and magnification controls that are a cinch to use even with gloves on, and some even feature dual focus controls for coarse- and fine-tuning your sharpness. Is Focus Easy To Achieve? Many of these optics offer dual focus controls, allowing you to use a coarse knob to quickly adjust your view before fine-tuning the sharpness until your image is perfectly balanced. Vortex has taken care to make sure its focus knobs turn smoothly, while still offering enough resistance to prevent you from accidentally moving the controls when you don’t want to. The only real problem child here is the Diamondback, which offers almost perfect focus until you reach the upper end of the glass’s magnification, at which point a sharp image is almost impossible to achieve. How Are The Optics On Vortex’s Spotting Scopes? Vortex utilizes BaK–4 prisms in all of its products, configured in a porro prism design. The optics are fully multicoated, and phase correction coatings are incorporated to prevent phase shift. What Materials Does The Company Use For The Housing Of Its Scopes? Most of the time, Vortex produces its spotting scopes with rubberized armor, offering plenty of shock-resistance. In the case of the Razor HD, the manufacturer has also utilized an ArmorTek coating to protect the lenses from scratches, oil, and dirt. Vortex also tends toward the use of rotatable tripod rings, allowing you to configure your spotting scope into multiple viewing angles. Can I Use Vortex Spotting Scopes For Astronomy? Thanks to generously-sized objective lenses and terrific use of fully multicoated optics, the transmittance of Vortex spotting scopes makes them quite capable of being used for backyard astronomy. I’ve used mine to explore the surface of the moon, the rings around Saturn, and even the Galilean moons orbiting Jupiter. They’re obviously no match for true telescopes, but are still entertaining options for getting your feet wet in astronomy. How Durable Are The Scopes? Vortex seals its lenses with O-rings, while also charging the optics chamber with either nitrogen or argon. These spotting scopes are all both waterproof and fogproof, and the rubber armor also makes them shockproof. Vortex Optics’ spotting scopes might require a bit of investment, but it’s money well spent thanks to excellent craftsmanship and durability. Thanks for reading up on Vortex spotting scopes. These products, for the most part, are sound investments. They typically offer premium optics at prices that are just a fraction of what you might spend on a Swarovski. You also can find a Vortex spotting scope with either a straight or angled eyepiece, depending on your personal usage preferences.